Judith Handmade Treasures: Happy Halloween! Wishing everyone a fun and safe Halloween. My WDH and I live so far out of town that we do not get any Trick or Treaters. 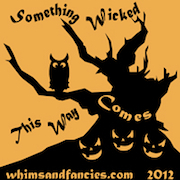 If you have not heard today is the last of Something Wicked over at Whims and Fancies so head over there for some paper pieceing Halloween patterns. Here is one of paper piecing blocks I sewed for my table stand. 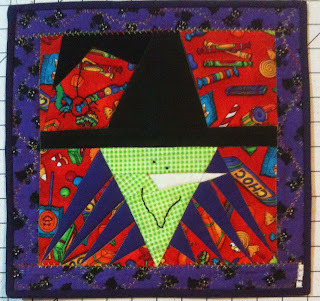 Also at Sew We Quilt, Madame Samm is surely to sew spook you of your rocker on Halloween. Make sure to stop back by on Monday for the Ur Priceless Coin Purse Blog Hop Nov 5 - Nov 13, 2012. I will be posting on the final day November 13, hope to see you then. Pixel Play in the mail! It's Friday and I have a busy weekend! New Blog Hop Coming Soon!